The Melbourne Greens have come on board and Officially supported the campaign to ensure that the counting of the ballot will be open and transparent and that scrutineers will not be denied the opportunity to properly scrutinise the electronic count. We welcome the Greens official support even though it is unofficial. We only hope that Bill Lang also excepts the need for the count to be open and transparent. Under the terms of the Local Government Act ballot papers MUST be presorted into bundles of primary votes as part of a manual count. The problem is that the VEC has the right to vary the procedure any way they see fit under a computerised count. Descension in the absence of regulations. 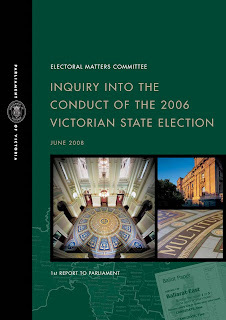 The Victorian parliament in reviewing the 2006 State Election recommended that ballot papers be presorted prior to batching and data-entry. We support the Parliament’s recommendation and note that there is nothing that prevents the Returning Officer from undertaking a pre-sorting of ballot papers prior to the data-entry process. The Greens have made an unofficial request to Mr Lang [VEC Returning Officer for the City of Melbourne] that the VEC bundle the primary votes of the leadership ticket candidates before the data-entry stage. I have reason to believe that Mr Lang will seriously consider doing this despite being under no obligation to do so. As we are only two days before ‘election day’, but already some months after the contracts for this election were agreed on, we consider it inappropriate to support any calls for an injunction. We are happy for you to indicate on your blog (without copying any part of this email) that The Greens give in-principle support to the bundling of primary votes of the leadership ticket only.